↑ National Research Council (2006-10-27). "Okra", Lost Crops of Africa: Volume II: Vegetables, Lost Crops of Africa 2. National Academies Press. ISBN 978-0-309-10333-6. Retrieved on 2008-07-15. 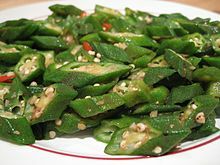 ↑ "Red Okra Information, Recipes and Facts". http://www.specialtyproduce.com/produce/Red_Okra_864.php. Retrieved on 2015-09-30. ↑ Austin State Gazette [TEX. ↑ De Rosa, I.M. ; Kenny, J.M. ; Puglia, D.; Santulli, C.; Sarasini, F. (2010). "Morphological, thermal and mechanical characterization of okra (Abelmoschus esculentus) fibers as potential reinforcement in polymer composites". Composites Science and Technology 70 (1): 116–122. doi:10.1016/j.compscitech.2009.09.013. http://www.sciencedirect.com/science/article/pii/S0266353809003480.